In the years between 2010 and 2014 the East Asia Department of Staatsbibliothek zu Berlin (Berlin State Library) digitized selected parts of its Berlin holdings. The digitization project “SSG 6.25 Digital” was co-funded by the German Research Foundation (DFG) and encompassed five segments of the collection in East Asian languages: the Waddell collection of Tibetan texts, one of the pioneers of Tibetology, the Manchu collection, the collection of pre-modern Japanese books (Libri japonici), the old China collection (Libri sinici) and the collection of the German sinologist Erich Haenisch. Additionally about 4000 titles in western languages published until 1912 relating to East and Southeast Asia were digitized. The collection can be viewed and searched in the Digitized Collections of the Berlin State Library. In 2013 first steps were made towards a virtual reconstruction of the old East Asia Collection of the Prussian State Library. Supported by a grant from the Commissary for Culture and Media (BKM) of the German Federal Government and in cooperation with the Biblioteka Jagiellońska in Kraków, Poland, the segments of the collection which as a result of the Second World War are nowadays kept in Kraków were digitized almost completely. Currently, the collection is in the process of being re-catalogued. More than 1.250 titles can already be searched in the OPAC of the East Asia Department and the images are gradually made available online the Digitized Collections of the Berlin State Library (for details see below). As early as towards the end of the 17th century, the Elector Friedrich Wilhelm von Brandenburg (1620-1688) had acquired the first Chinese titles for his library which he had opened also to scholars and guests. In 1683 a printed list compiled by Andreas Müller named, after all, 25 mostly Chinese titles. In the following years the collection only grew sporadically and with long periods of acquisition intermissions, until in the 19th century access to Chinese and subsequently Japanese titles became easier. By means of systematical acquisition trips to China by Karl Friedrich Neumann at the beginning of the 19th century and Herbert Müller in the early 20th century, as well as the purchase of collections by Friedrich Wilhelm Karl Müller, Friedrich Hirth, Paul Georg von Moellendorff (mainly Manju titles) and Eugen Pander (Tibetan titles), the holdings were developed into a pre-eminent working basis for those interested in China and East Asia. The last accession number in the book-form catalogue of the Libri sinici N.S. (Neue Sammlung, i.e., new collection) dates back to 1939. In 1943, the East Asia Collection of the former Prussian State Library comprised about 72,000 volumes and was, at the time, one of the most important and largest collections of its kind in the Western world. Only about 24,000 volumes returned to the library which after the war found itself being situated in what by then had become part of the Soviet occupation zone. A small fraction of materials that went to Marburg were those holdings of the Staatsbibliothek which had been evacuated during the war to places that now were part of the Allies’ occupation zones. To a large extent, the old East Asia Collection is today considered destroyed or missing. Nearly one third of the old Collection – approximately 20,000 volumes – was located after the war on now Polish territory and was later transferred to the Biblioteka Jagiellońska in Kraków, where today it comprises a part of the so-called “Berlinka”. There the materials are accessible in the special manuscript reading room. In 2011, both the German and the Polish side expressed their shared interest to work on the East Asia holdings among the Berlinka. This mutual understanding was extended in 2012 to include the aspect of digitization as well as the possible virtual reconstruction of the old East Asia Collection of the former Prussian State Library. After an initial one-year grant was allotted by the Commissary for Culture and Media (BKM) of the German Federal Government, the East Asia Department of the Staatsbibliothek zu Berlin was able to start in early 2013 with the visual inspection and selection of titles to be digitized in Krakow. The cataloguing of the books in Krakow according to present-day standards is mainly done following the digitization of the items by referring to the images of the material and still continues. Up until today (March 2019) more than 1.250 items have been catalogued and can be searched through the OPAC of the East Asia Department of Staatsbibliothek zu Berlin. 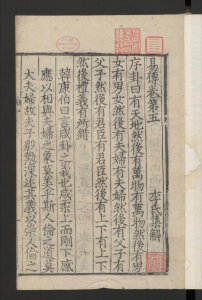 More than 1.000 items (541 Sinica, 449 Tibetica, 59 Manjurica, and 3 Mongolica and Japonica each) have already been made freely available online through the Digitized Collections of the Berlin State Library (search with verlagerte Bestände digital Ostasiatica). Libri sin. and Libri sin. N.S. Up to 1912 the Sinica and Manjurica in the East Asia Collection of the Royal- and later Prussian State Library were assigned the shelf marks Libri sin. After that, on the occasion of an incipient large-scope and systematical acquisition the shelf marks were changed to Libri sin. N.S. (Neue Sammlung, i.e. new collection). Altogether, there were 1603 Libri sin. shelf marks assigned to about 900 titles. Libri sin. N.S. 2049 is the last historical shelf mark of the New Collection (Libri sin. N.S. 1651-2049) and was assigned to a title published in 1935. Printed catalogues in book-form for parts of both of these segments do exist, albeit the entries are partially rather sketchy. They are available in digital format and can be accessed in the Digitized Collections of the Staatsbibliothek (a structured access is possible here). In each of these three handwritten catalogues in book-form only titles marked with a red checkmark are available in Berlin, those marked with „K“ are located in Krakow, the whereabouts of titles without mark is unknown. Essential parts from both shelf mark segments can be found in both Berlin and Krakow. Considering 309 titles in Berlin and 84 in Krakow, the digitization project will make it possible to provide digital access for the general public to about one quarter of the historical Libri sinici (Libri sin. and Ms. sin.). 211 Libri sin. N.S. titles are kept in Krakow, about fifty percent of the former holdings have found their way back to Berlin. This means that after their virtual reunification, about two thirds of this old segment can be accessed. The shelf marks Libri sin. N.S. started with works that had been purchased by Herbert Müller (1885-1966) for the Royal Library in Peking, Shandong, Henan and Shanghai between 1912 and 1914 on the basis of a list of desiderata. Herbert Müller had studied Law, Economics, Ethnology and Linguistics. He worked under F.W.K. 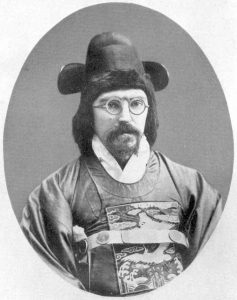 (Friedrich Wilhelm Karl) Müller in the East Asia Department of the Berlin Ethnological Museum, the collection of which had also been acquired by the Royal Library; today it is kept in Krakow (cf. below). Herbert Müller undertook his trip to China during the years 1912-1914 on behalf of the museum, mainly to collect archaeological materials. The Libri coreanici collection consists of only 64 call numbers, Libri cor. 1 to Libri cor. 64, but in fact it comprises more than 64 individual titles. All titles are printed, most of them date from the first half of the 20th century, some from the middle to second half of the 19th century. Some are yet to be dated. Many of them can be found in other institutions as well. 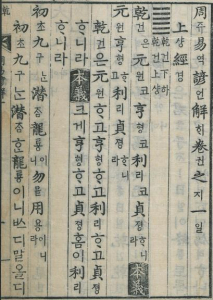 Yet there is one part of the Libri coreanici collection that deserves special mention here: Some 30 딱지본 소설 Ttakchibon sosŏl, examples of the first paperback novels printed in the Korean alphabet. They were mass produced and (re)tell different kinds of stories about well-known characters in Korean literature and history, tell romance or detective stories etc., and were very popular in the 1920s and 1930s. Their colourful covers are real eye-catchers. Until now, there could be found no indication of their existence in the catalogues and documents of the Berlin State Library. Their discovery came as a surprise for the East Asia Department. Friedrich Hirth (1845-1927) had originally studied Classical Philology in Leipzig, Berlin and Greifswald, before in 1869 he turned to the study of the Chinese language, encouraged by the recruitment of Sir Robert Hart (1835-1911), the organizer of the Chinese Custom Service. Just a year later he assumed office as Customs Assistant in Canton where he stayed for five years, studying, among others, the local Cantonese language. In 1875 Hirth was transferred to Amoy as Assistant and later Head of the local Custom Office. From 1877 to 1888 he was active in the Statistical Bureau of the Custom Office in Shanghai. At all these different postings in China Hirth cultivated his contact to and exchange with scholars. During his last years in Shanghai he was elected President of the local China Branch of the Royal Asiatic Society. 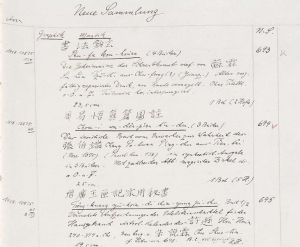 He himself characterized his library as one „mainly serving the sinological problems of the time.“ In 1890, when Hirth returned to China after a longer stay in Germany, it was acquired by the Royal Library. According to the list written by Hirth, the collection contained 175 numbers (11 for manuscripts, 164 for prints). Just as the collection of von Moellendorff, the Hirth Collection was evacuated to the three locations of Banz, Beuron und Fürstenstein during the war. In Krakow today are 149 numbers extant. Paul Georg von Moellendorff (1847-1901) had studied Law, Linguistics and Oriental Studies. In 1869 he accepted an offer to work under Sir Robert Hart in China’s Imperial Maritime Custom Service. Von Moellendorff stayed until 1874, when he entered the Consular Service of the German Foreign Office in China. In this capacity he was active in Canton, Peking, Tianjin and Shanghai. Upon the recommendation of Li Hongzhang 李鴻章 (1823-1901) he went to Korea in 1882 where he worked as Advisor to the Foreign Ministry and, a year later, he became Vice-Minister. He stayed for three years, when, due to external circumstances, he returned to China and re-entered the Chinese Maritime Custom Service. Von Moellendorf died in 1901 in Ningbo. The collection of von Moellendorff supposedly entered the Staatsbibliothek in 1931. In the course of the evacuations during the Second World War, the collection was moved to the three locations of Banz, Beuron und Fürstenstein. Today 39 items of this collection are in Krakow. They mostly contain works on the Manchurian language and literature as well as translations of Chinese works into the Manchurian language. Friedrich Wilhelm Karl Müller (1863-1930) had studied Theology, before he turned to Oriental and East Asian Cultures and Languages, especially the Arabic, Chinese and Syrian languages. 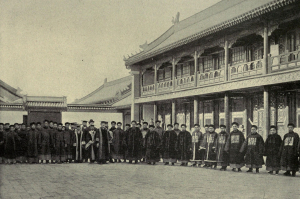 Between 1887 and 1928 Müller worked at the Ethnological Museum in Berlin, at first as research associate and since 1906 as Director of the East Asia Department. 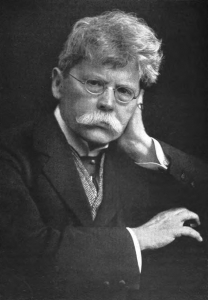 Müller made a name for himself when he deciphered the – mainly Middle Persian – manuscript fragments which had been recovered during the Turfan expeditions (1902-1914), and for his discovery of Manichaean writing among these texts. The collection was put together in 1901 by Müller in Peking. In Krakow there are today 205 items from the collection mainly in Chinese, but also in Manchu and Tibetan. Eugen Pander (1854-1894[?]) was Professor of National Economics at Tongwenguan 同文館 College in Peking since 1881. He was a collector of Lamaist books and works of art. The entire collection was acquired by the Ethnological Museum in Berlin accessioned in 1889, but the books later passed into ownership of the Royal Library. The Pander collection encompassed under A. 370 prints and manuscripts of Tibetan origin, under B. 315 prints and manuscripts from Peking, under C. 40 prints produced by Imperial command – the latter group containing texts in Tibetan, Mongolian, Chinese and, Manchurian. D. 60 volumes Tibetan canonical literature – commonly referred to as Pander Pantheon: parts of the Wanli Kanjur and the so-called Supplement of the Wanli Kanjur, E. 12 Mongolian manuscripts and prints as well as F. 68 Chinese prints and manuscripts. The Pander Collection was moved during the Second World War to Fürstenstein (today’s Ksiaz) and transferred from there to Grüssau (present-day Krzeszów). Today the entire collection (except for three missing titles from part A.) is preserved in Kraków. During the project all items from Pander A. were unfortunately not available and the items Pander B . 32-50 were undergoing conservational treatment and therefore also not available for digitization. Hopefully this can be done at some time in the near future. Thupten Kunga Chashab and Filip Majkowski. 2015. Catalogue of the Tibetan texts in the Pander Collection. Part A (complete) and Part B (partial), held by the Jagiellonian Library, Cracow. Warsaw: Dom Wydawnicy ELIPSA. Mejor, Marek, Helman-Ważny, Agnieszka and Thupten Kunga Chashab. 2010. A Preliminary Report on the Wanli Kanjur Kept in the Jagiellonian Library, Kraków. Warsaw: Research Centre of Buddhist Studies, Faculty of Oriental Studies, University of Warsaw.